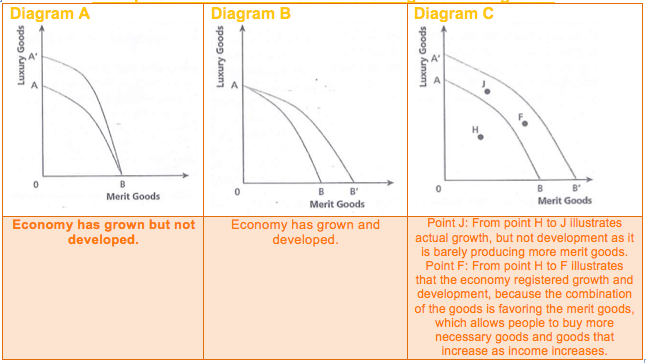 To illustrate your answers to examination questions on Growth and Development you can use the most basic economic model very effectively. 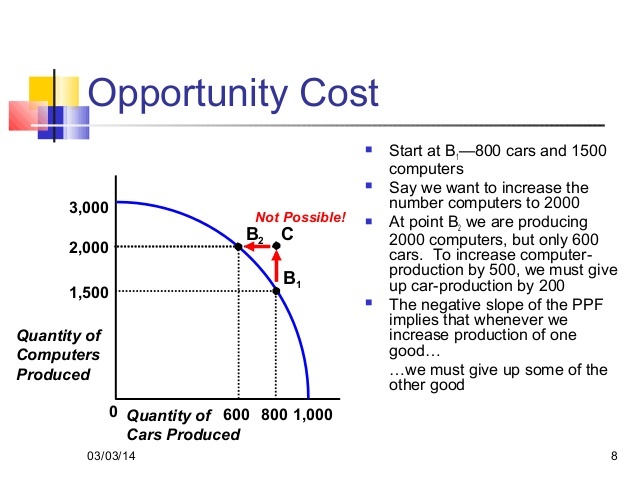 Production Possibility Curve showing all the possible combinations of Computers and Cars an economy could produce. Combinations outside the boundary (frontier) are unattainable (like point C) because there are not enough resources. To explain the PPC you need to describe how it is constructed. The diagram on the left shows that if the country were to produce only computers (Y-axis) using all its resources efficiently it could produce 3,000 - this is one point on the Computers axis (0 Cars:3,000 Computers). Similarly if the country produced only cars, using all its resources efficiently, it could produce a maximum of 1,000 cars. This is an alternative point (1,000 cars: 0 computers), this time on the Cars axis (X-axis). Alternatively the country can produce any combination of computers and cars along the PPC. 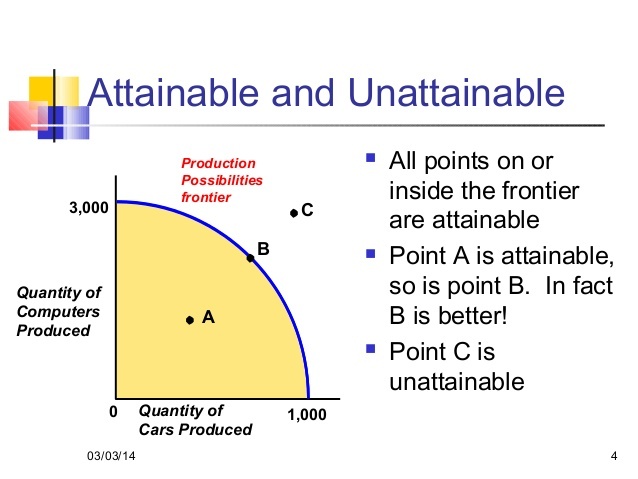 Point A (300 Cars: 400 Computers) is attainable because it is inside the PPC and shows that all resources (Factors of Production) are not being used efficiently. In fact we could infer there is unemployment at this point. Point B (700 Cars:2,000 Computers) is also attainable and because it lies on the PPC we can infer all resources are being used efficiently - no unemployment. Point C (900 Cars: 2900 Computers) is unattainable because it is outside the limit of the PPF and there are not enough resources to produce both these quantities). NB The PPC is downward sloping showing a trade-off: More cars must mean less Computers along the PPC. It is curved outward to reflect that resources are not perfectly interchangable - Diminshing Marginal Rate of Transformation. Economic Growth is defined as the ability of an economy to produce more goods and services (increase in GDP). In the diagram on the left there has been an increase in either (or both) the Quantity or Quality of Factors of Production. 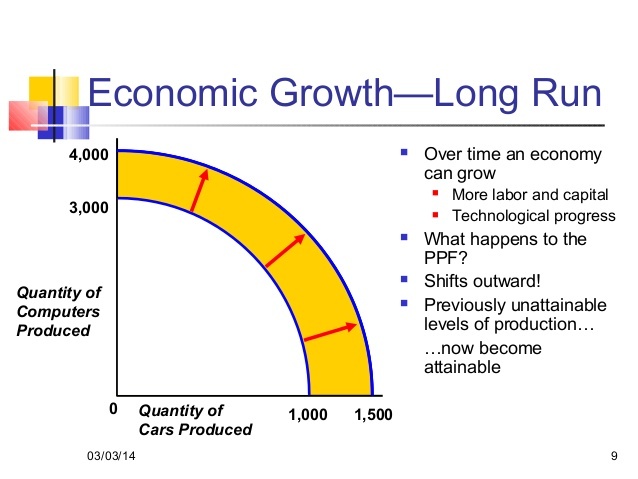 This means the PPC shifts outwards reflecting the increased ability of the economy to produce both Cars and Computers. Actual Growth is shown by a movement from one point to another point, moving outwards - in the first diagram above actual growth could be a movement from point A to point B. Potential growth is a shift of the whole PPC outwards as in the diagram to the left.